With only a handful of hours left now till the end of the window, we have to say Rangers did play a blinder with regards Alfredo Morelos. Not only did we (seemingly) hold onto the Colombian but we’ve done so at least till the summer, where the fat and serious bids should start to flow if he is to leave. Rangers have an eight-figure star on our hands, closer to £20M than £10M and enough clubs are aware of him and want him for Rangers to take anything less than a very high amount. Galatarasay came and went, Nice came and went – and none were convincing in any bids to make Rangers look up. But there is one small part of this whole story fans may forget – Alfredo, linked to China. Alfredo, linked to France. Alfredo, linked to Turkey. "I dream every day of playing in the Premier League. I want to improve in each training session so I can get there." AKA – it’s all very well if every club under the sun outside England bids for Morelos, he doesn’t want to go to them. Until that day a top Championship or EPL side actually bids hard cash, hard serious money, Alfredo Morelos will go nowhere. 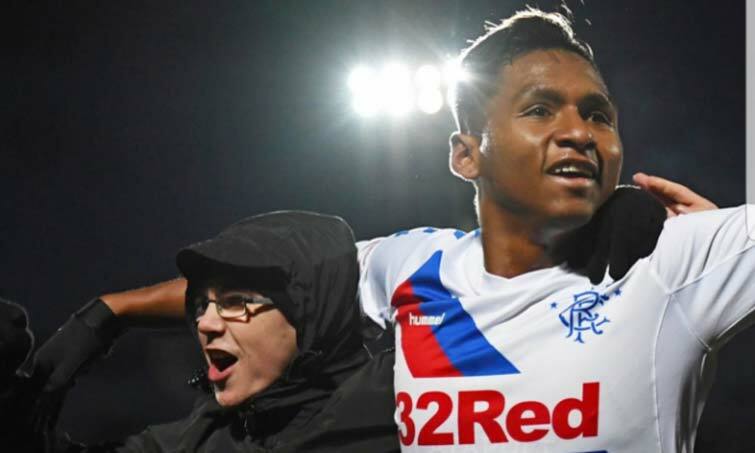 That’s Rangers’ security – there’s hundreds of clubs, thousands possibly who have the finance to push for a move for Morelos, but unless one of them happens to be south of the border, the chances are the Colombian isn’t interested in the move any more than Rangers are in selling him for £8M. He also does look happier at Ibrox these days – the rare smile is coming out more and more and his reaction when some boisterous fans staged a mini-pitch invasion at Livi said everything – he seems content and he’s doing the business on the pitch. He’s the best striker in the SPL, and Rangers have at least another six months of his service before this circus starts all over again. Well, unless a Southampton or Fulham fork out £20M in the next few hours that is…. Stevie G said we never got any bids for any of our players. So talk of Nice and offers from Turkey were just that, talk. Most clubs in England will look at his disciplinary record and pass on him. To get anywhere near £15m he will have to start improving in big games IE against Celtic. If scouts look at the games against Celtic it looks like his bottle crashes, just look at the sitters he's missed against the manky mob. These bidders are taking the... They know our admin story and still think we're 'desperate'. That myth, needs to be dispelled, toot-suite. The answer to lowball offers, is disgracefully HIGH, counter offers. Even I, as a humble buyer & seller, know that. I reckon some people on our board, need to go back to business school. The only players i'd take a bit of a loss on, is Pena & Herrera. Mainly because we are lumbered and there is not high demand for them. Well, if there were no bids entered they were hardly taking the piss were they. It appears that Nice made enquiries about him, were informed what it would take to make the deal happen, and promptly ran for the hills. At the end of the day he's only worth what someone is prepared to pay. Bigbaws is spot on about his record in the bigger games(Old Firm, Europe league proper) being pretty mediocre; he's also not a regular with the Colombia national team(which would increase his value) and buying clubs might be put off by the fact that he's such as hothead. Just saying..
...Who do we buy to replace Him?